As very large complexes with multiple buildings and energy-intensive uses, airports have huge opportunities for energy conservation and energy-related tax deductions. Because airport facilities operate 24 hours a day and have many energy-intensive activities, they are uniquely positioned for large energy-efficiency projects. In addition, airports are typically sited near densely populated metropolitan areas, where the electric grid is already experiencing increased demand stress related to finite electrical supply. As a result, airports should consider themselves obligated to invest in energy efficient facilities to prevent the grid from reaching peak demand, when the most inefficient power plants must operate. The tax deductions available under Code Sec. 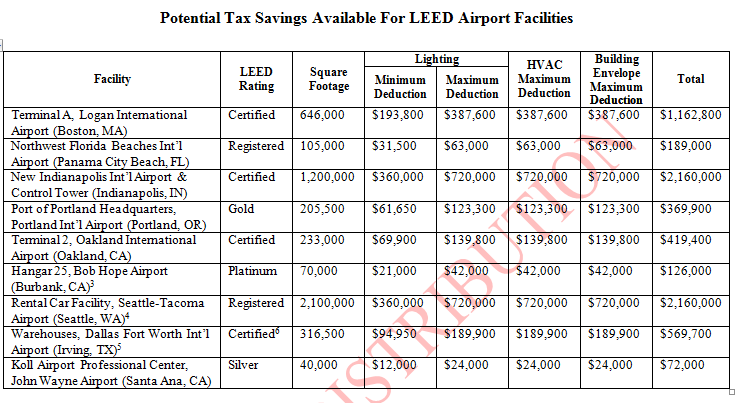 179(D) for energy-efficient buildings can provide major tax savings to owners of private airport enterprises as well as designers of government and government authority-owned airports. Each component can qualify for up to 60 cents per square foot EPAct tax deductions. The building envelope is anything on the perimeter of the building that touches the outside world including roof, walls, windows, doors the foundation and related insulation layers. Due to their large and closely concentrated building configurations airports are perfectly situated for highly energy efficient central plant HVAC energy equipment solutions that utilize and or support multiple facilities. Thermal storage and highly energy efficient centralized chillers are two such HVAC strategies. Last year, Hawaii’s Honolulu International Airport replaced existing air conditioning systems with a centralized chiller plant that is 50% more energy-efficient than the previous units. Similar upgrades are planned for two other Honolulu International Terminals, with annual electricity cost savings of $2.3 million projected by 2010. Chicago’s Midway Airport is another excellent example of efficiency through centralized HVAC systems; the Midway Airport Central Heating and Refrigeration Plant has chillers as well as nighttime ice production and ice thermal storage facilities. By utilizing this stored “coolth” (stored thermal energy) for daytime air conditioning, centralized facilities can reduce their peak loads, resulting in significant cost savings for utilities with time-of-day electricity pricing along with major EPAct HVAC opportunities. Similar thermal storage systems are now being introduced for airplane cooling. Although not eligible for EPAct benefits, airports such as Miami International are saving energy and money by relying on preconditioned air and thermal energy storage systems to cool planes on the tarmac. Most planes on runways are cooled with auxiliary power units, which are inefficient and can use up to 120 gallons of fuel per hour. In addition to thermal storage and central plant systems for energy-efficient HVAC, airports are also positioned well for the use of solar photovoltaic panels for electricity generation. As large facilities with enormous rooftop areas and no nearby obstacles to cast shadows, airports are a great location for large PV arrays, whether self-operated or leased out as part of a power purchase agreement. Airports also experience high air conditioning loads during peak daylight hours, which is precisely when solar PV panels have their highest output, making solar panels a well-matched power source for airport cooling systems. LEED, which stands for Leadership in Energy and Environmental Design, is the fast growing marquee standard for sustainable buildings. LEED is the certification system established by U.S. Green Building Council (USGBC). The four certification achievements start at the LEED certified level and proceed to the higher LEED silver, gold, and platinum levels. Although LEED is not referenced directly in the EPAct tax provisions LEED qualification involves computer model simulation results to document target levels of energy efficiency as does EPAct. More importantly LEED generally requires adherence to ASHRAE 2004 lighting that performs at the ASHRAE 2004 energy efficiency levels will generally either qualify for EPAct tax deduction or come very close to it. The new LEED 2009 system places an even greater emphasis on energy-reduction strategies, positioning buildings certified under the new LEED guidelines for large tax deductions . Virtually every one of the numerous facility categories comprising an airport complex can become LEED certified as evidenced in the accompanying exhibit. Certain LEED points, such as proximity to mass transportation and to minimum number of a variety of retail support services are by definition easy for an airport to achieve. Accordingly, there is strong support for the position that all future airport construction and expansion should be at the LEED level. In fact, some airport facility experts argue that due to the impact that airports have, even achieving LEED certification isn't enough of a minimum baseline. It is particularly surprising that none of the LEED airport facilities identified above are New York Port Authority facilities, since the Port Authority oversees three major airports in the New York area. The private companies involved with airports are often large national organizations that support numerous airports including car rental companies, retailers, parking garage operators and warehouses. Most of these organizations have now have some LEED certified facilities or highly energy efficient prototype facilities. Airport management can highly encourage or perhaps mandate by lease terms that these same companies provide airport related facilities at the highest level. In addition to more energy efficient facilities supported by tax incentives, airlines are becoming more focused on clean aviation fuels also supported by tax incentives. At the end of 2009 15 major airlines and air cargo companies have announced biofuel purchasing initiatives. They are negotiating to buy billions of dollars of fuels made from vegetable oil, coal and petro coke, a byproduct of refining petroleum. At the end of 2009 13 airlines signed a memorandum of understanding with Rentech Inc. to buy jet fuel made at a proposed plant in Mississippi. Rentech says its fuel has a smaller carbon footprint than petroleum because the C02 excreted from the production process will be subject to carbon sequestration and injected into a Gulf Coast oil reservoir. Presumably this process will be eligible for a new $10 per metric ton Carbon Dioxide Credit provided in American Recovery and Reinvestment Act of 2009. Airports are in the process of expanding laptop and cell phone charging capabilities, since virtually every traveler now has one or more devices requiring frequent recharging. Presumably every airport in the country is evaluating vehicle recharging systems, which will be required for the numerous new electric vehicles entering the market. These recharging resources will be need for passengers, rental car centers, airport support vehicles and airport employees. In particular long term parking areas provide a perfect vehicle battery recharging opportunity. Airports are typically large facilities complexes encompassing very large stand alone buildings including terminals, parking garages and other large structures. The EPAct tax incentives drive off of square footage which is ideal for these building complexes. Dallas-Ft. Worth airport is mandating that all future expansions and major renovations meet minimum sustainability and energy efficiency standards. Hopefully all airports will follow this lead both for expansions and existing building retrofits. Airport facilities managers can effectively manage the overall facilities complex to the highest efficiency levels by replacing banned lighting, mandating energy efficient commercial lease standards and purchasing highly energy HVAC. Energy efficiency is no longer off the airport radar and the EPAct tax incentives can help commercial airport tenants and government facility airport designers get the required job done. See Charles Goulding, Jacob Goldman and Taylor Goulding, The Tax Aspects of Thermal Storage and Time of Day Pricing, Corp. Business Taxation Monthly, November 2009, at 13. See Charles Goulding, Taylor Goulding and Amelia Aboff, How LEED 2009 Expands EPAct Tax Saving Opportunities, Corp. Business Taxation Monthly, September 2009, at 11. See Charles Goulding, Jacob Goldman and Taylor Goulding, The New $100,000 Fertilizer and Agricultural Chemical Industry Tax Credit, Corp. Business Taxation Monthly, September 2008, at 33. See Charles Goulding, Peter Kelly and Taylor Goulding, EPAct Tax Deductions for Parking Garage Lighting Gain Wider Use, The Parking Professional, September 2008. See Charles Goulding, Jacob Goldman and Malcolm Thomas, The Energy Tax Aspects of Warehouses and Distribution Centers, Corp. Business Taxation Monthly, October 2009, at 15. All new DFW airport facilities must be build either at the LEED level or incorporate LEED principals. This is an important development since DFW has identified approximately 6,600 acres of available land that can be developed to support the airport. In October of 2008, DFW's airport planning department issued a 15 page booklet entitled Airport Image Elements that provides detailed design guidance for airport building design. See Practical Analysis comment regarding this credit by Charles R. Goulding in the CCH publication American Recovery and Reinvestment Act of 2009 at paragraph 545.